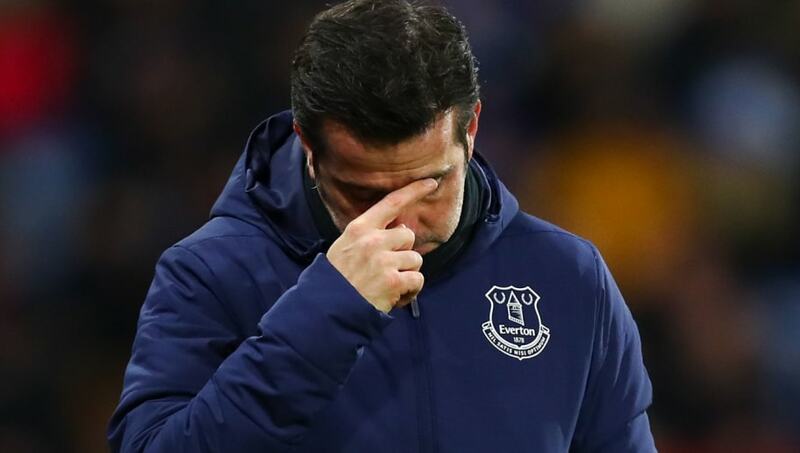 ​Marco Silva was less than impressed with his Everton side as they fell to a 3-1 defeat at home to Wolves. Silva expressed his frustration after the match particularly for the goals which he felt came ‘too easy’. Everton bounced back with a win against Huddersfield last week after falling to two shock defeats against Southampton and Millwall respectively in the week prior. It put Silva’s side just two points behind seventh-placed Wolves going into this crunch clash. The Toffees hoped to carry that momentum into this game and to leapfrog their opponents in the Premier League table. They never really got started though and it was a performance marred by sloppy play throughout. Leighton Baines started this game despite being subbed with a suspected injury aggravation last week. The 34-year-old has made just six appearances this season but was trusted against Wolves by Silva and it proved to be wrong decision. Short on match fitness, it was just five minutes into the game when Baines was caught out and he brought down the advancing Matt Doherty in the area, conceding an early penalty. Ruben Neves made no mistake from the spot to hand Wolves an early lead. Andre Gomes levelled for Everton with a cracking solo effort before a needless Micheal Keane foul handed the ascendency back to the visitors, who scored from the resulting free kick. Leander Dendoncker added a third for the visitors to wrap up proceedings and the Everton boss was once again unhappy with his side’s effort in the build-up.